The story about two billionaire rivals never gets old. 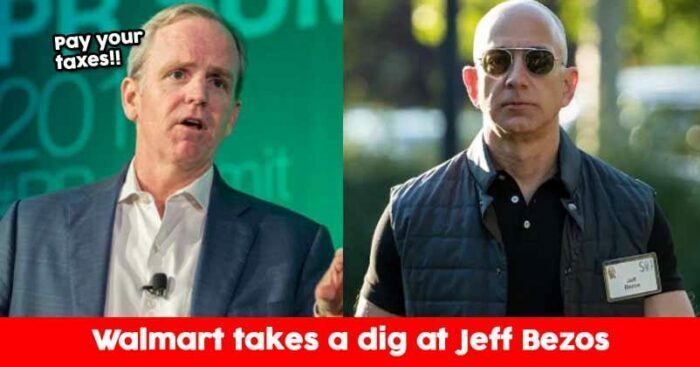 Adding another one to the endless list is the war of words that took place between Amazon CEO, Jeff Bezos and Walmart Executive Vice President of corporate affairs, Dan Bartlett. Amazon which belongs to the world’s richest man Jeff Bezos pays a more minimum wage to its employees as compared to Walmart.Taking a strike at Bezos’s comment Bartlett tweeted, “Hey retail competitors out there (you know who you are) how about paying your taxes?”, along with an article highlighting how Amazon hadn’t paid any taxes. In his letter, Bezos pointed out the way hike given by Amazon had benefited more than 2.5 lakh Amazon employee. But to take a note Walmart has raised its minimum wage twice since 2015 and now pays an entry wage of $11 per hour. As per CEO Doug McMillon, Walmart’s average U.S. hourly wage is $17.50 including bonuses based on store performance, and excluding healthcare benefits. Amazon and Walmart are two of the biggest arch-rivals in the e-commerce industry and it will be amazing to see how Bezos reacts to Walmart’s tweet.